One statement I hear all the time is, “I really do care, but what are some ways I can prove it?” After this past weekend, I don’t have to look far for examples of how to care about the poor and hurting in our community. Volunteers sorting food back at the Manna House. Saturday was Manna Cafe’s yearly Combat Hunger food drive. Every year, through a partnership with 5-Star Media Group and area grocery stores, we do this massive food drive; this year we were in 11 stores and raised more than 27,000 pounds of food—and another 25,000 pounds can be purchased with the money that was collected. This was by far our biggest and best Combat Hunger in the history of Manna Cafe. 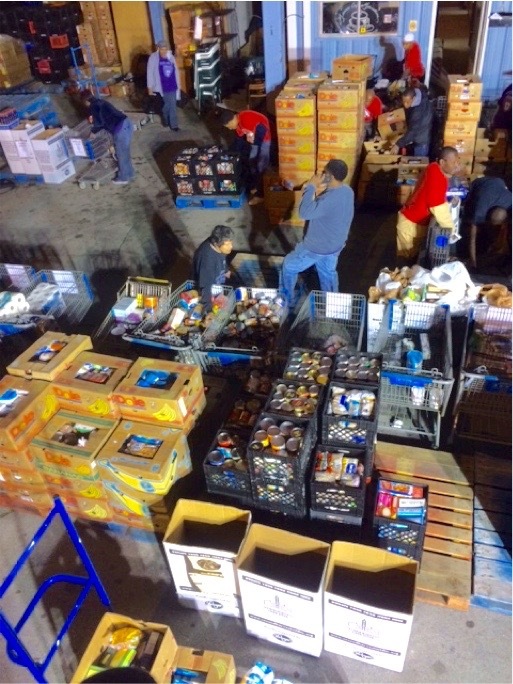 Every person who bought food to put in those buggies and boxes proved they care by just participating. Some of the most amazing stories that I came away with on Saturday involve the people who donate the food: the ones that come out of the store with a grocery buggy full of food, take out a bag with a few items in it (which you are gratefully expecting them to give you) and then give you the whole cartful and keep the small bag for themselves. Also there were several stories at every location of folks who gave food and said, “We’ve had to use your services before and just wanted to give back.” There were those we recognized as regulars at either our meals or food box distribution who bought an extra can or two to donate just so they could be a part of the day. But the story that really got to me was this: Hilltop Market’s food drive began one day early, so on Friday I was collecting food donations when a person came up and told me that he’d been by our warehouse earlier that day to get food for his family. Then he thanked me for my service as he put a can of pork ‘n beans that he’d bought into the food drive box while saying that it wasn’t much, but he wanted to give back. My eyes are tearing now as I remember the smile on his face as he proved he cares for others. Sometimes we’re too busy looking for the big, grandiose ways to serve God and we overlook the small things that please Him even more.